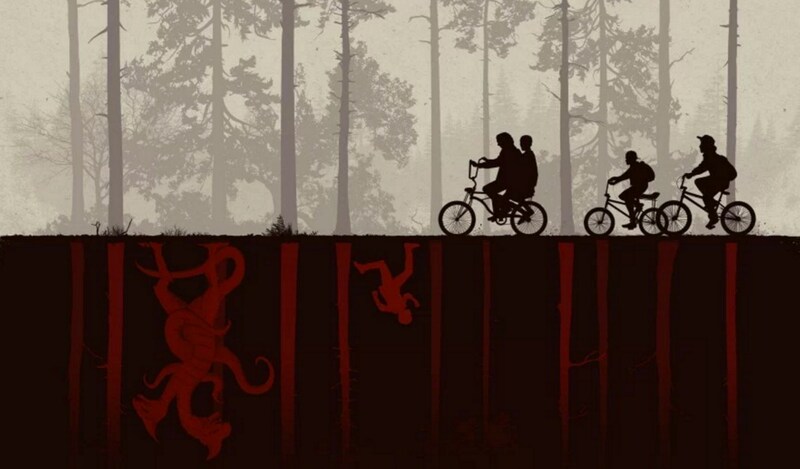 When the gang from Hawkins Middle School gets together for Season Two of Stranger Things, it doesn’t take long in the show (or trailer) to realize the evil from the upside-down is still reeking havoc on their small, quiet Indiana town. The show’s creativity and authenticity are pure gold, and it’s been a blast watching it in the days leading up to Halloween. The scared, wide-eyed wonder of the paranormal the kids have in Stranger Things has been a reminder that, although I’m pretty sure there aren’t any demogorgons in my backyard, there is a bigger struggle at play than simply flesh and blood. The kids discover that the roots of evil are literally running beneath Hawkins, leaking a virus that seeks to kill and destroy (John 10:10). Their experience with this current evil and the lessons learned in Season One leave them with a sobering fear knowing that what lurks in the shadows might actually get you (RIP, Barb). For the crew of Stranger Things, the weight of evil is real, confusing, and confounding, but they know with certainty they must resist and defend. And even with resisting the upside-down and the monsters that spew from within the cracks, there is no relent of the wickedness that stirs beneath; for some, the darkness is felt like a chill that permeates the entire body. And yet, the boys put on their homemade Ghostbusters outfits (Ephesians 6) and wage war. And it’s the children that uncover, explore, and defend against all that is wrong in the world (with Matthew’s words ringing clearly throughout each episode: unless you change and become like children, you will never enter the kingdom of heaven). Now, I was never one to don a zombie costume or throw on the newest Mike Myers movie but there is a sense that knowing fear, not just feeling it, is tied intrinsically to knowing that we need saving. That when we are flipped into the upside-down of our own lives, when death rears its ugly head or its many manifestations, that a proper response is to have the fear of a child. Unfortunately, the older we get, the pangs and pains of sin seem to become more complex and convoluted. It’s not as if our costumes come off and we feast on the candy but it’s usually the other way around; we indulge thinking that our costumes are our true selves. The video loosely follows a little boy on Halloween night but features other characters struggling with fear. The song featured in the video, “Moniker,” comes as the last installment of a three-part ode to death whose other parts are scattered throughout the album. “Moniker,” like the two parts before it, is sung from the perspective of death. Death explains his perception; the names people refer to him as, how art depicts him, and the worry people connect to his being. He also reflects on his nature; he’s never the kind to be late, or wait, or that you can call him whatever you need to when he comes knocking. If Death’s humanlike reflection of perception and self sits like a weight on the chest, then his exposed weakness in the last verse is like oxygen to the lungs. He admits that it’s a guarantee that he’ll be “phantom and sting/ But I’ve been de-clawed”. This notion that death is real but has also been de-clawed is brought home in the music video. When Penny & Sparrow sing of death’s de-clawment, the little boy and his friends prance and charge through a graveyard symbolically and literally trampling death beneath their feet. This imagery does not negate the metaphors and nature that death expounds on early in the song or in life nor makes them less true. It does something better; it gives hope that the decisive statement, the de-clawing of death, the knock-out blow, the final victory over the upside-down, the death of the demogorgon, and righting of all that has been distorted, has been accomplished by Christ who entered into all of it for our sake. Halloween, in a way, reminds us of our fear and the masks we choose to hide behind long after our childhood has passed. We are prone to retreat, hide in the shadows, or ignorantly convince ourselves with ears plugged and eyes covered, that evil doesn’t exist. The good, seemingly impossible news, is that in our deathly state, Christ’s perfect love drove out fear and conquered the darker, stranger things on our behalf. And because of that, we can boldly participate in his plan of making all things right side up as they are truly supposed to be.